← To Bomb or Not to Bomb—Which Rationality? Whose Debate? The TakeAway: Two drama, Breaking Bad and All the Way, provide insights into complex characters, and lessons for our times. Time collapsed earlier this week, as volcanoes from the past and present erupted and converged in a manner that only great art can produce. On Sunday, I watched the highly acclaimed AMC series Breaking Bad air its penultimate, gut-punching episode, “Ozymandias”, the third to last episode that ranks as the highest in TV history. Breaking Bad chronicles roughly one year in the life of a fictional character named Walter White, who morphs from being a brow-beaten, cancer-stricken high school chemistry teacher (whose moment of glory was eclipsed by family responsibilities and a competitive partner), only to become an accidental drug kingpin, mixing high-grade quantities of crystal blue methamphetamine. All the Way chronicles one year in the life of President Lyndon Baines Johnson, who morphs from being a Southern political kingpin (whose moment of glory was eclipsed by his allegiance to Southern opposition to racial equity and a charismatic competitor named John F. Kennedy), only to become an “accidental president” mixing high grade quantities of political persuasion, high ambition, and social responsibility. In Breaking Bad, last week’s episode featured a gruesome knife fight between the main characters, all of whom we’ve come to love and the last thing we’d come to expect. In All the Way, LBJ bellows, “There’s no place for ‘nice’ in a knife fight”—referring to Washington’s main characters, very few of whom we’ve come to love and the first thing we’ve come to expect. Both dramas are Shakespearean in their portrayal of “heroism”—or anti-heroism. Both convey the marbleized nature of power and aspiration, of civic virtue and the compromises you make to do good in the world. Both are about the grey area between means and ends, intent and impact. Both grab you by the throat, shake you left and right until your eyes roll into the back of your head and you’re gasping for breath, and don’t let you down until the curtain drops. Like great art, both leave you spent. You chew on it for days, and can’t get it out of your head. Both characters are portrayed by one of the finest actors of our time, Bryan Cranston. He’s won three Emmys already, and likely will add to his collection this Sunday night when the annual award show airs on CBS. No doubt, if All the Way goes to Broadway, he’ll pick up a Tony, too. But he’ll be busy: Cranston has agreed to star as Hollywood blacklisted screenwriter and author Dalton Trumbo in his next film role. I won’t get into an exegesis of Breaking Bad—there’s a lot of fine writing out there on that, and likely future Ph.D. theses—or All the Way, but a few things stand out that I think are relevant to our times. First, both shows share a larger-than-life lead character where initials play a prominent role. For Walter White, it was his initialed, inscribed copy of Leaves of Grass left in an inappropriate place that led to his downfall. For LBJ it was—well, he was LBJ! I’m fascinated by the aura cast by great presidents known only by their initials or nicknames: FDR. JFK. LBJ. Even “I Like Ike”. Second, both leads are surrounded by equally complex supporting characters that give texture and depth to the plotline. 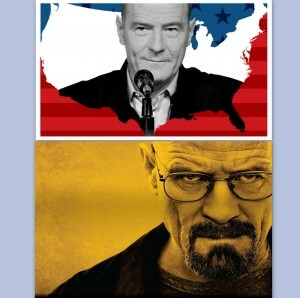 I should make that plural, because while there’s a through-line through each—Breaking Bad is, as creator Vince Gilligan acknowledges, the story of a fella who goes from Mr. Chips to Scarface, while All the Way chronicles a pivotal year (1964) in Lyndon Johnson’s ascension to the Presidency—there are other equally compelling narrative arcs. Families, associates, customers, constituents, even nemesis—all share important responsibilities for pushing along a sweeping story, complete with random moments of levity and electrifying acting. Yet while both Walter White and LBJ loom large, in the end, it’s the “community” that matters, not the singularity of one man. Yes, each unleashed a process that took on a life of its own, as the cliché goes. And yes, each held others in thrall as he spun his web, a mix of manipulation and deceit, ambition and “service” because each saw himself as responsible for the welfare of others. But our judgment of each is tempered by our knowledge of the impact his actions had on others. For Walter White, in the end, he destroyed his family in his quest to protect it. For Lyndon Johnson, in the end, it was Vietnam that destroyed his presidency and his quest to win the War on Poverty—something he announced on January 8th, 1964, during his first State of the Union Address. Third, as powerful as they became, in the end, it was something seemingly small that did them in. Neither Walter White nor LBJ could control the forces surrounding them, yet prided themselves on being master strategic thinkers. But big events always begin with small grievances, little things that you don’t notice until they fester and grow. For Walter White, it was that Walt Whitman book of poems left behind the toilet. For LBJ, it was a U.S. destroyer named Maddox wandering around the Gulf of Tonkin collecting intelligence, which morphed into a hotly-contested issue of who, or what, fired the first shot. Fourth, as great art does, each portrayal shows all the moral haze, the grey areas between right and wrong that reflect the behavior of real people, despite a public mask and rhetoric of certitude. Walter White’s morality became corroded by the means he chose to achieve his goals—almost 300 people have been killed, and there’s a website that shows the death toll (up through last year). LBJ’s morality—he’d deny you could call it that—became corroded not just by the means, but by the context in which he chose to achieve his goals. He inherited Vietnam, and was committed to fighting Communism. But what he got wasn’t what he expected, according to Presidential recordings. So long, War on Poverty. Hello, “Johnson’s War”. Fifth, and this probably is most relevant to the work many of us do, there always are comprises that need to be made when following an ambitious agenda. You don’t just sit around and wish for something. You have to go out there and do it. And “getting it done” means compromising in ways that can leave you wondering what you started out to do. I saw this up close and personal while working with one of LBJ’s Cabinet officials, Robert C. Wood (whose daughter Maggie Wood Hassan is currently Governor or New Hampshire), who knew a thing or two about power and execution. For Walter White, dying of cancer meant that he had to take care of his family. For LBJ, the War on Poverty meant that he had to focus on a range of social welfare programs and community action. Each had to figure out the best strategies to achieve these aims. For Walter White, that meant setting up a meth lab and bypassing his family. For LBJ, that meant continuing the FDR legacy of Federal government as a tool for change, and bypassing the states. The compromises along the way—horsetrading here, sucking up there, relying on carrots and sticks to move things forward—were but part of the tolls you pay to play the game. In All the Way, Martin Luther King, Jr. is seen as making these compromises, too: by 1964, his Southern Christian Leadership Conference (SCLC) already was being challenged by young upstarts such as Stokely Carmichael and Bob Moses, who were less patient with the long game King had in mind. By the time of the “Freedom Summer” campaign to register black voters—a subtext of All the Way, and a continued issue in the American story as this summer’s Supreme Court decision demonstrated—King knew that he risked being outflanked by groups of young people who were less inclined to follow a non-violent path. On June 21st, 1964, the Ku Klux Klan murder of three Civil Rights workers—James Chaney, Andrew Goodman, Michael “Mickey” Schwerner—in Nashoba County, Mississippi, while they were registering black voters, unleashed a firestorm of anger and opposition. The formation of the Mississippi Freedom Democratic Party (MFDP) and their demands to be seated at the 1964 Democratic Convention ultimately turned on a compromise: the 68 delegates would be allowed to enter the hall at Atlantic City, but only two would be given the power to vote. In All the Way, King is shown caught in the middle: on the one side, the MFDP members appeal to him to support their cause. On the other, United Auto Workers (UAW) union chief Walter Reuther threatens to withdraw funding support for King’s SCLC if he doesn’t persuade the rebels to desist. 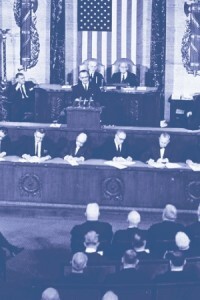 In the play, LBJ proposes a compromise and dispatches Hubert Humphrey to the MDP delegates to work it out, but word of the dissidents agreeing to it gets leaked to the press before they have a chance to decide. I could go on, but I won’t. Tomorrow there will be all kinds of reviews of All the Way, which will be much more finely drawn, no doubt many drawing comparisons, too, with Walter White. For me, having lived the very same history that All the Way dramatizes—and worked with people who were there—it was a deeply personal experience. It also revealed the challenges facing any of us who seek to make positive social change. You can’t be a Walter White milquetoast, but you can’t end up a murderer, either—either directly, as in Breaking Bad, or indirectly, as in All the Way. Living with integrity is like sailing on a choppy sea. You’ve got your eye on a North Star, but you’re also lurching this way and that along the way, maybe even capsizing. There’s never a sense of absolute purity, and you’re being dishonest if you think you’re the only one with all the answers, the savior of souls and society. Doing good doesn’t make you good. You have to earn it. Be it literary or not, that’s something both Walter White and LBJ understood. This entry was posted in Commentary, Ethics and Values, Notable People, Politics and tagged All the Way, American Repertory Theatre (A.R.T. ), Andrew Goodman, Bob Moses, Breaking Bad, Bryan Cranston, Dalton Trumbo, Freedom Summer, Great Society, Gulf of Tonkin, Hubert H. Humphrey, James Chaney, Jr., LBJ, Lyndon B. Johnson, Maggie Hassan, Martin Luther King, Michael Schwerner, Mississippi Freedom Democratic Party (MFDP), Ozymandias, Percy Bysshe Shelley, Pope Francis, Robert C. Wood, Southern Christian Leadership Conference (SCLC), Stokley Carmichael, Vietnam War, Walt Whitman, Walter Reuther, War on Poverty. Bookmark the permalink.